The greatest ancestor of Maine painting just might be Camille Corot (1796-1875), a leader of the Barbizon School in France. Claude Monet (1840-1926) is the obvious champion of Impressionism -- the undeniable great grandparent of Maine landscape painting -- and Monet did not quibble about his debt to Corot: "There is only one master here -- Corot. We (the Impressionists) are nothing compared to him, nothing." Monet's teacher, Eugene Boudin (1824-1898), was a pupil of Corot. Much like how elevators made skyscrapers possible, plein air painting awaited the invention of tubes for paint. And with such tubes in hand, Corot helped take painting outside. That led to a number of changes: natural light, an interest in efficiency, wet on wet painting, less reliance on slow techniques like glazing and so on. Glazing is the technique of overlaying many layers of thin, transparent paint to render light, atmosphere and spatial effects within a painting. It dates back to the earliest sophisticated use of oil paint by Jan van Eyck (ca. 1390-1440) and remains to this day most deeply associated with Dutch master painting. Through the 19th century, glazing was the primary approach of Europe's leading painters. Winslow Homer's technique was criticized as beastly and unmediated because he didn't glaze enough. Maine artist Jon Allan Marshall paints like a 17th-century Dutch master: He is dedicated to glazing. It's a wonderful thing to see traditional Maine paintings side by side with someone who paints in a genuinely traditional style comparable to Rembrandt. Seeing Marshall's paintings in the same room as, say, Scott Moore's Maine landscapes is incredibly interesting. Moore's "Swift River Bend," for example, features thick strokes of lusciously wet paint pushed all around amongst each other. The Impressionist technique of scumbling -- putting colors next to each other -- is what drives Moore's expansive sense of color even within an ostensibly subdued, organic landscape. Marshall's paintings achieve qualities of light, color and space that can't rely on brushy bravado, but rather hard work, skill and technique. This slows down the surface and draws you in. There are details that don't follow the stroke of a brush and qualities of spaces, volumes and light that we rarely see in Maine. They are not Bob Ross studio tricks but rather time-consuming tools in the hands of a talented and patient master. My favorite is "Interior Brook." It's a small oil on panel view of a stream-cooled niche in the forest. The midsummer leaves hang lazy, lush and heavy over a trickle-fall fed pool. The sun streams in from the upper right, but only reveals its brightest self on the far, deep left trees as they open along the stream that feeds the pool. The light chartreuse of the brightest leaves marks the upper end of the systematic coloration of the scene. Tumbled granite boulders -- long at rest and lichen-covered -- form the ground for trees that range from ancient birch on the right to bright new growth on the left. Despite the virtuoso textures, what is particularly remarkable about "Interior Brook" is Marshall's use of glazing for spatial effects. The layered glazes create genuine depth through which our eyes travel spatially rather than as across a colored surface. While there is little room for flashy brushwork in Marshall's paintings, any close glance reveals his facility with a brush. The singular exception to Marshall's sea and landscapes is an extraordinary self-portrait. (Portraits are usually commissions, after all, rather than exhibition pieces.) It reveals Marshall's skill like nothing else. The complex interior space and light work perfectly within the scale of his strokes to present extraordinary detail without straying into the neurotic over-focus of many hyper-realist painters. It's the strongest portrait I have seen here in years. Marshall's best paintings show a range of space. "The Kennebec River" for example, succeeds up close, through middle spaces and along the distance -- all by balancing the sense of detail and light. His "Crawford Notch," on the other hand, shows only a deep space behind a near-ground repoussoir. While the seemingly simplified equation of near/far could disappoint, Marshall plays a very satisfying trick by using the texture of the linen's bumpy surface (think burlap) to set the scale for the tiny trees. It reminds us that Marshall isn't some Munsell-system painting machine but a smartly creative artist very capable of wit. Marshall's most intriguing two works feature creatively painted frames. Whether Mondrian or Marin, this isn't usually my thing, but Marshall's "Birch" is just as brilliantly witty as it is gorgeously painted. A trompe l'oeil birch sprig lies across the bottom of the frame while the painting features a drawing of birch blossoms nailed to the tree. It's a smart bit of postmodern wit in which the old school tips its hat to the new. Marshall is one of those artists who lives and works in Maine yet has mostly shown elsewhere. But when David Findlay Galleries closed, NYC's loss became our gain. Marshall is an exceptional painter and it's good to see him here. The David Findlay Galleries are pleased to present an exhibition of recent paintings by the Maine artist Jon Marshall. 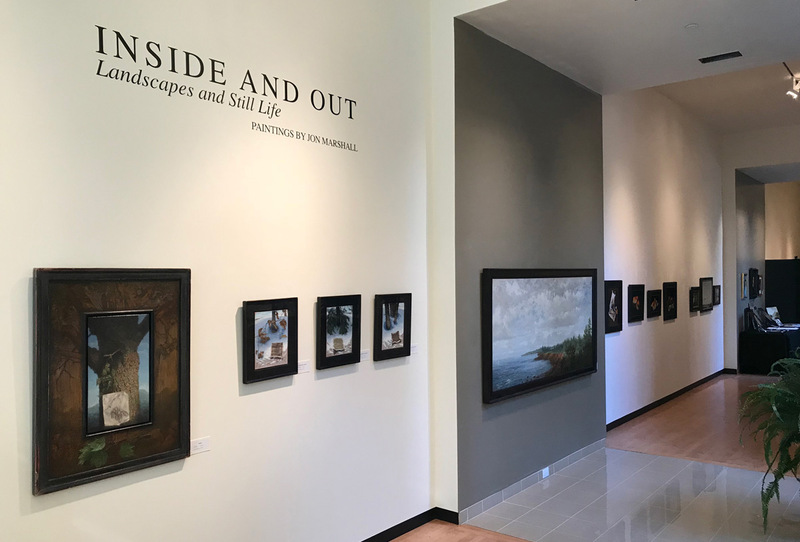 This is Mr. Marshall's second solo exhibition at the galleries. A special afternoon reception to honor him will take place on Saturday, March 31st from 2 to 4 pm at the David Findlay Galleries at 984 Madison Avenue (at 77th Street). The artist will be present at this reception. Mr. Marshall's mastery of the art of landscape painting has been unfolding with marvelous proficiency over the last 13 years ever since he moved to Maine in an area close to mountains where he regularly walks and from which he continuously receives inspiration. New England and Prince Edward Island are the settings for the paintings in this collection and they provide the three major subjects on view: mountain, sky and seacoast. Another group consists of close-up of three different trees in which the frame itself is an integral part of the picture. One can easily note Mr. Marshall's debt to the great Dutch masters of the 17th Century. In fact, it was his extended stay in Holland as a young man that enabled him to closely study the treasure trove of Dutch painting in its native environment and determined his decision to become a fine art painter. 17th Century Holland was truly a golden age of landscape art. Mr. Marshall demonstrates that the artistic virtues that were pervasive at that time, vitality of expression, freshness of outlook and exquisite technical skill, are as relevant and valuable today in the United States of the 21st Century as they were in that fabled era. He proves that the powers of perception that the Dutch developed to the highest peak of perfection are infinitely transposable and that there is no end to their profitable application in new settings and locales. Underscoring this point, Mr. Marshall describes himself, modestly, as a regional painter very conscious of his New England roots. What elevates his art above mere regionalism is the quality of imagination he brings to each painting. He is a plein air painter, but, as he puts it, of a "very reluctant" sort. The real work goes on in his studio where he will paint from memory with a suggestion gleaned from outdoor sketches. Many of the places depicted are real and recognizable ones. At the same time, by working imaginatively, he is free to take liberties with the massing of form and to invent skies, clouds and the play of light and shadow so as to achieve the quiet nobility that dignify his settings. Only by using his imagination distilled through memory is he able to convey the immoveable stillness and solidity of earth's formations enveloped by the mercurial changes of light, wind and weather. There is power in the subtle atmospherics created by these two completely different essences coming into contact with one another and held together by the eye of the artist. It is no accident that Mr. Marshall's paintings communicate directly to the inner being of the viewer a strong and pleasing sense of peace, wholeness and order. Mr. Marshall's method is to carefully prepare the painting surface, be it gesso on panels, sanded copper or primed linen. Each layer may be scraped or sanded leaving a surface upon which he will continue to build in sedimentary fashion until the painting is completed. This is a very deliberate technique to achieve the high finish and richness of depth which is characteristic of his work. Another part of his process of creation is to work on several paintings at once. He is very confident to leave a piece fallow for a period of time because he knows from long experience that he will come back to it with fresh insights and renewed vigor. This also helps to explain an overall unity to his body of work. Mr. Marshall takes a very physical, craftsman-like approach to his work which stands in somewhat paradoxical relation to the elegance and stunning beauty of the end result. It is an approach very much in accord with his basic attitude of the artist as someone who serves a higher purpose outside himself. He has no patience whatsoever with the artist who exalts himself. Nothing delights him more than when one of his paintings adorns a home and becomes part of its cherished ambiance. Mr. Marshall was born in 1964 and raised in Quincy, Massachusetts. He is a graduate of the Massachusetts College of Art, Boston. He, his wife, Kristi and their three children, Bethlehem, David and Grace, reside in Denmark, Maine. Gallery Hours: Tuesday through Saturday, 10 AM-5 PM.